If you new to the Minecraft world, it can be very challenging to figure out how the effectively fend off monsters and harvest materials that are useful. This is why it is essential to know how to build your structures properly so that the rest of your building will be as required. If you want to build a specific structure, the first step is to plan it out and carefully start to lay the foundations. When you are trying to find out which design you like best, you may observe that more advanced designs of structures never have a square shape and this is because of the fact that a lot of people believe that this shape makes structures less appealing as a result of its simplicity. This is why it is important to have as much knowledge about your design as possible. Before you start to build a new structure, you will have to make sure that you know what type of design you want your new structure to have. This is why it is important to first research the type of structure and design that you want your building to be like. You might also be required to terraform in order to prepare for your construction to take place. Terraforming is often the longest process when trying to build a structure. Once these processes are complete, then building the structure should be very easy. Getting the design of your structure right is very important in order to make sure that the rest of your construction process will go according to plan. And, once you have chosen the design that you want for your structure, the next step is now to plan it out and start to lay the foundation. This design guide will help you choose the type of design you want your structure to be like in the Minecraft world. The shape of your structure is very important to design your building and it affects everything from the foundation to roof of the building. Many players often prefer that their structure have a simple design but other players often prefer building designs that have more complicated shapes and are a little bit more challenging to build because of the fact that it will make a more impressive structure. Below are examples of shapes that are often used to design the structure. The most popular examples of quadrilaterals that are used to design structures in Minecraft are rectangles and squares. These two shapes are also considered by many to be the easiest shape to design. These shapes are often used as a base for simple, four-sided rooms and construct flat walls. This shape is the ideal choice for players that want to design a simple structure. Examples of structures that are designed with these shapes include the cube. The cube is the smallest housing structure in the Minecraft world and it only requires half a stack of material. This structure is just a 3x3x3 cube and it provides little space for a furnace, chest, bed and a crafting table to be placed in the ground. This shape is most often used to design roofs, but triangles can also be used as a base if you are okay with having a diagonal wall in your structure. However, some players might believe that this shape makes your building more difficult to decorate inside or to connect with other structures. This shape is not like the other shapes in the Minecraft world that are blocky in nature. Circles are often incorporated into structures that have more impressive designs. However, one common problem that occurs when trying to use this shape in the design of your structure is having the proper knowledge on how to effectively make curves. The pyramid is a widely recognized shape from the landmarks of ancient Egypt. Its foundation is often started with a big square base then it will be built upwards. This shape has a lot of similarities to pyramids and it is designed in a similar manner. The triangular prisms are often incorporated into the design of structures like attics and tents. This shape is a shape that is similar to a circle and is another example of a curve. The small spheres are often integrated into the design of structures to add extra details. But a more challenging design that can use this shape in its design is the spherical base. It is also possible to design this shape by adding circles to the sides of a cube. If you want to design a spherical base for your structure, you can follow these instructions below to know how to design one. Try to use the yellow outlines as a guide and build five circles of increasing sizes. Then, design another circle that has precisely the same size as the largest of the five circles. And finally, you will design four additional circles that have a decreasing size in the opposite direction. These instructions will help you design an ideal sphere in the Minecraft world. There are some structures that are often designed in a strategic manner in locations like on a cliff or mountain, or in the center of a big lake. 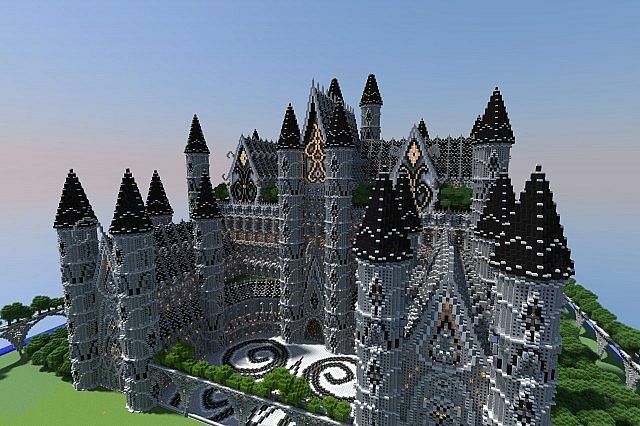 It is also said by many players that by building your structure in a strategic position like a Minecraft, the structure will appear more authentic and more impressive. This type of structure is often designed in a way that it will be capable of withstanding attacks from siege engines and preventing enemies from entering your structure by climbing it with ladders. These walls are often big and thick and could be of any height and thickness, although most players prefer to keep their wall at about 3 to 6 meters thick. It is also essential that you design your walls with strong materials like cobblestone in order for it to be able to effectively fend off enemies. Some players might also decide to put some small windows in the walls or make parts of the wall stick out every four blocks.